Commercial cleaning has come a long way in even just the last few years. Commercial cleaning has gone from the realm of the bucket and mop to high tech equipment, environmentally conscious supplies and methods, and innovative approaches. Not only is this innovation exciting, it is efficient and economical. One constant around businesses is the goal of cutting costs and maximizing the bottom line and cleanings new lean and mean approach helps Facility Managers meet their budgetary AND maintenance goals. While there is some great new equipment and products that bring the janitorial industry into the modern age, many of the innovations have been with the approach to cleaning itself. Here, we discuss the two predominant methods to cleaning a commercial building: zone cleaning and team cleaning. We’ll explore what both mean and why team cleaning has far reaching benefits for Facility Managers, Janitorial companies and all of their people. When dividing up the cleaning and maintenance duties required in a facility, the old method was to use zone cleaning. With zone cleaning, you divide a building into separate areas that became the responsibility of assigned cleaners. With zone cleaning, each cleaner was responsible for every cleaning task in their zone, often an entire floor. That means with zone cleaning, every cleaner needs to vacuum, clean restrooms, empty trashes, dust and more. This has some real disadvantages. First, because each cleaner has a diffuse set of responsibilities, it is easier to miss tasks leading to a less than optimal clean. Second, because each zone cleaner must vacuum, dust, clean restrooms and more, they each need their own set of tools, equipment and supplies. That means a lot of costly equipment. And with multiple vacuum cleaner purchases, you can believe your cleaning company will try to hold on to them as long as possible whether they are working great or the best technology available. Third, zone cleaning takes longer because cleaners are switching tasks often, even multitasking, which is slower and thus takes more labor hours. From an effectiveness, efficiency and economical perspective, zone cleaning simply isn’t the best way to clean a large building. Team cleaning is a newer approach that is significantly more lean and effective. It’s such a simple, effective approach; it’s amazing we didn’t think of it years ago. With team cleaning, individuals master a few specific tasks and perform them throughout your facility. So, there might be a light duties specialist, a vacuum specialist, a restroom specialist and a utility or general specialist whose duties may vary. The team becomes like a target ‘Special Ops’ team with each team member responsible for a very specific set of duties. Team Cleaning creates job mastery, a clear understanding of the work and a heightened level of accountability. 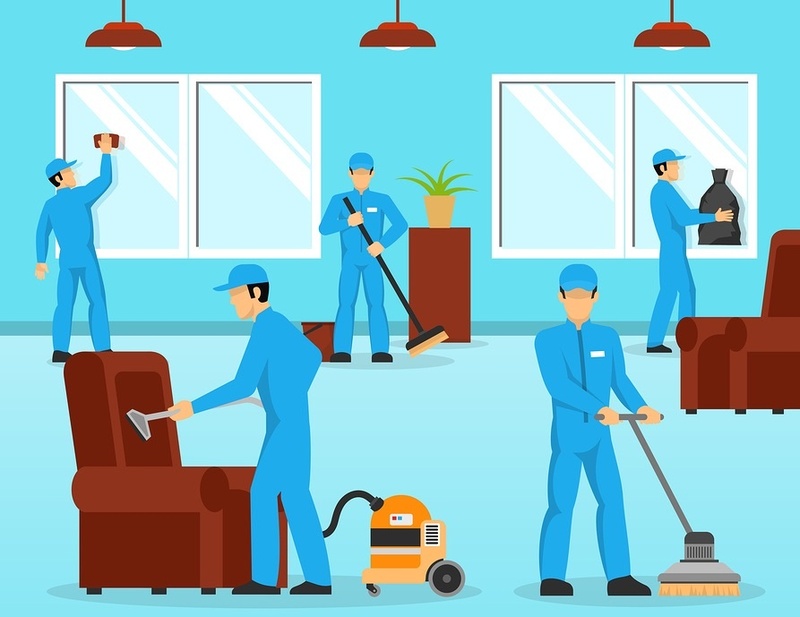 Likewise, because of the need for less equipment and even labor, team cleaning is significantly more efficient in addition to being more effective. Specialists are far more likely to clean the right way, each and every time. In this way, team cleaning is typically more responsive and more consistent. And team cleaning also has a flexible structure that can be custom tailored to adapt to the unique needs of your facility. Finally, because each cleaning team member is doing a specific set of duties, there are far fewer equipment purchases needed. This frees up janitorial companies to buy better equipment and replace it more often with the latest and greatest technologies available. In a small office building with just a few rooms, one set of restrooms, a small break room and a single conference room, one nightly cleaner is likely to be sufficient. But in larger buildings and more complex facilities, one cleaner doing a multitude of tasks just isn’t the most efficient, effective or fiscally sound way to do things. Research tells us that humans just aren’t the great multi-taskers we would like to believe we are. Focusing on a small number of repeated tasks is much more likely to result in consistent work, high efficiency and even a level of task mastery that makes people feel good about the quality of work and expertise they deliver. If you think that perhaps lower skilled workers don’t feel a sense of pride in their work, think again. Here at Stathakis, we have many team cleaners who proudly consider themselves expert vacuum techs or master restroom cleaners, and they are! They do these tasks with so much frequency, that they become very, very skilled at doing them quickly and well. Team cleaning CAN help you manage reduced cleaning budgets without throwing your facility’s maintenance into a nose dive. Specialization most often means less equipment and fewer labor hours. Labor and equipment are the two largest costs for most building maintenance companies and thus, when your janitorial services company has reduced costs, you have reduced costs. Finally, while there is never one single way to do something, there is usually one BEST way to do it. In the case of team cleaning, the positive outcomes far outweigh those of zone cleaning. If you aren’t happy with the quality or cost of commercial cleaning you are getting from your current janitorial services company, it might be time to herald in the future with a commercial cleaning company grounded firmly in the 21st century and beyond.